In this brief tutorial I would like to introduce you to the concept of recording nature and wildlife sounds. This includes capturing the sounds of individual birds and animals, as well as general stereo natural ambiences. I aim to give an introduction to the type of equipment you willl need in order to get started in this field. In no way do I pretend that this will be a comprehensive article covering all angles on the subject, but it should give you some basic guidelines to get you started. The most obvious thing that you will need is a microphone or microphones. No single microphone type is going to cover all your needs for recording nature, wildlife and ambiences. The recording of individual birds or animals requires a different microphone and different technique from the recording of background and natural ambiences. Here are some guidelines that will hopefully help you determine your microphone needs. For the recording of individual bird or animal sounds, you want a microphone that is very directional in it’s pick up pattern. You want the microphone to pick up sounds from in front of it, while largely rejecting sounds to the side and behind it. There are two types of microphone that are designed to do this effectively. They are the shotgun microphone, and the parabolic dish microphone. These are most often held in a pistol type grip, or in the case of a shotgun microphone, may be held on a boom or fish pole. Most often individual subjects are recorded in mono. Shotgun microphones employ a hypercardioid or super cardioid capsule set back in an interference tube that cancels frequencies to the sides, while focusing on those to the front of the microphone. The longer the barrell, the more directional the mic is. The shorter shotgun mics are reasonably compact and easy to handle, and the better models produce very good sound recordings. Generally it is best to have these set in shock mounts to prevent handling noise, thumps and bumps. Some examples of quality shotgun mirophones are: Sennheiser MKH416, Rode NTG-3, AKG C568EB, Sanken CS-2, Audio Technica BP 4071. Parabolic dish microphones gather sounds from a larger area and focus them on the microphone, through the use of a reflector, making the mic very directional. Because the area of sound collected by the dish is larger than that of a shot gun microphone, it in effect delivers more sound to the microphone capsule. Because of this they have great sensitivity, and increased signal output, and enable low noise operation. This allows the possibility of recording quieter and more distant sounds than those of a shotgun microphone. Cardioid or omni microphone capsules are aimed at the reflecting dish, and collect the sounds gathered by the dish. Disadvantages of parabolic dish microphones are that the sound may be sharper and less natural sounding than those achieved by a conventional microphone, and unless the dish is very large they are not suitable for recording low frequency information. They are also somewhat large and unwieldy. The best known models are made by Telinga. For the recording of ambiences, we require different microphones and a different technique than for the recording individual subjects. Often times we wish to record these in stereo, and so stereo micing techniques come into play. Stereo recording with spaced omni microphones requires the use of two identical microphones with omni capsules used as a spaced pair. Positioning is critical when using a spaced pair, and it is a case of experimenting as to the placement and distance apart of the microphones. Spaced omni recordings tend not to have as strong a center image as XY recordings do,and can seem to suffer from a “hole in the middle.” So hence this technique is not particularly suitable for gathering individual sounds. However, on the other hand, if you are gathering background ambiences that are likely to be used mixed in with sharper, more defined sounds recorded with a shotgun or parabolic microphone, then spaced omnis may be perfect. Having a bit of a “hole-in-the-middle” of your natural ambience track can make it easier to position a separate sound in the forground and center, without it competing with the background ambient sounds. X-Y stereo micing is a common way of recording stereo sounds, and in field recordings it is often a good choice, particularly if you don’t want to have microphone stands placed a distance apart. The idea is to set up a pair of cardioid microphones (usually on a specially made stereo bar and on a single mic stand) crossed at approximately at right angles (or slightly wider angles)to each other. This achieves a nice wide stereo image from in front of the mics, while rejecting sounds that emanate from the rear of the microphones. To keep good mono capability it is advisable to have the microphone capsules crossing next to each other. This means either having one microphone placed above the other, or on the same plane and head to head. A disadvantage of this technique over using a pair of spaced omnis is that cardioid capsules tend to color their off axis response more than omnis do, and when recording wide stereo ambience backgrounds this may not be particularly desirable. Omni microphones will only give you good stereo if you separate them by some distance. Having two omni microphones placed close together will really only yield a recording of two near identical mono sounds unless there is some type of barrier placed between the mics. While having omni mics set as a spaced pair may give you good results, this setup will also be less mobile, so having X-Y mics either on a bar or held in two pistol grips may be more practical in many situations. An affordable small diaphram condensor microphone that is available in matched pairs, with screw-on capsules of different polar patterns, and can be used in either the spaced pair of omni or cardioid X-Y configuration is the Octava MK-012. Stereo microphones on the other hand can be handheld and still have a wide pickup pattern. They can be handy for recording ambiences such as forests or the surf at a beach. They can also be used to record streams and rivers. The additional of mono microphones placed strategically can also be useful, and there exists the possibility of blending these with the stereo microphone recording later. Models of stereo mics that have shotgun amd M/S capsules in one microphone include Audio-Technica BP4029, Sanken CSS-5, and Sennheiser MKH418S. They utilise a hyper-cardiod shotgun capsule to capture the central “M” (Mid) detail, and a separate figure of eight capsule within the barrell of the microphone to capture the “S” (Side) signals.The Rode NT-4 is a stereo microphone that has two capsules placed in an X-Y pattern. Stereo microphones usually have a special 5-pin XLR connector to send the signal to two separate mic preamp inputs. Whatever microphone configuration you decide to go for, one thing that is common to all when you are doing field recordings is the need for wind protection for the microphones. Nothing can spoil recordings more than microphone distortion caused by wind in the capsules. For most situations the use of a blimp, such as those made by Rycote for example, and a fluffy windjammer (also often known as a “Deadcat”) is the best solution. However, sometimes you can get away with just have fluffy windjammers made of fake fur placed tightly over the microphones. Foam wind shields on their own do not offer enough protection outdoors in the wind. Parabolic dish microphones usually have their own wind protectors. One thing that is common to most nature and wildlife recording is that you can roll off the low frequencies ( unless recording crocodiles or something of that nature) to minimize unwanted noise from handling and wind etc. There are many portable digital recorders available these days that capture very good quality recordings. It is even possible to use the internal microphones in some of these and still get pretty good sonic results. 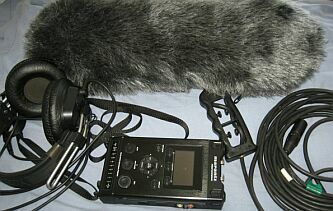 If you do use the internal microphones found in portable recorders you will need a fluffy windjammer placed tightly over the microphones to prevent wind noise. However, better results are normally still gotten by plugging condensor microphones into these recorders, either utilising their internal mic preamps, or plugging microphones into separate preamps, and then feeding the signal to the recorder via analog, s/pdif or AES/BU digital, firewire or USB connections depending on what the recorder includes. The smaller pocket sized recorders usually only have 3.5 m mini jack connections, while the larger semi pro and professional models include XLR microphone connections. The latter type of connector is preferable because they lock in place, are much more secure and less prone to pull out accidentally. The larger models usually have better built-in microphones, better preamps and better metering as well. Separate level control for each mic input is a desirable attribute. Good mid-priced recorder models include the Marantz PMD661, Sony PCMD-50, Tascam DR-100, and Fostex FR-2 LE. The 7 series Sound Devices (702, 702T and 722) are rather pricey, but are some of the best professional recorders on the market. It is a good idea to include a good pair of headphones in your field recording kit. Try to use a pair of studio grade headphones that exhibit good sound reproduction and seal well over your ears if possible. It helps to be able to hear what you are recording while you are out and about. Some studio headphones that are designed for acoustic music recording have quite a low output volume which may mean quiet sounds are not so easy to hear. Obtaining some phones with a higher output may be better suited to outdoor recording. Regardless of what type of microphone and setup you use, the closer you can get to the subject the better the signal to noise ratio will be. At 100 meters distance, even with a parabolic microphone, you will still have more self noise, background noise and preamp noise to deal with than you would if the same subject was 10 meters away. Get as close as you can without disturbing the subjects you are trying to record. Also consider having some weather protection available for yourself and your equipment, because you don’t want to be caught out having a bunch of expensive equipment unprotected in a surprise downpour of rain. This entry was posted on Wednesday, April 4th, 2012 at 10:04 pm	and is filed under Tutorials. April 2013: Fantastic Value – Sound Effects Packs Added!